I feel so lucky I found Clare! I came across her when I was searching “fertility massage” online. I was desperately trying to conceive my second child following 4 pregnancy losses in a year. I was having acupuncture, seeing a nutritionist, doing yoga and meditating and was basically in very good health but coming up to 42 years of age I started to worry it may never happen. I was so lucky to get an appointment almost immediately upon meeting Clare I instantly felt a connection to her. I found her to be so warm and felt she completely understood my journey. She instantly made me feel safe and secure in her space. I was able to work through the pain and frustration of not being able to conceive a healthy pregnancy and move through the grief of the multiple losses (due to chromosomal issues). I had been obsessing about my age, my unhealthy eggs, my repeated miscarriages, having obsessive thoughts and was giving too much energy to the most unlikely scenarios. All in all I was in a dark place! My sessions with Clare really helped keep me positive to move forward with trust. She was very reassuring and each time I left her I felt a feeling of hope and positivity. Then finally after only 2 sessions I fell pregnant again! The session with Clare after I conceived was particularly amazing. Understandably I was very nervous and we worked a lot on trust, with great visualisations that helped me connect with my new much wanted pregnancy. I’m now 32 weeks with a perfectly healthy baby boy, feeling him kick as I type this. I’m still seeing Clare for massages which I just love and is hugely relaxing while I prepare both my body and my mind for the birth. I will never ever forget my wonderful sessions with Clare and highly recommend her to any women needing emotional and physical support, dealing with fertility and trying to conceive. Clare, I feel so blessed to have met you! I am a 36 year old PCOS sufferer and I have been experiencing painful, irregular periods since I was a teenager, sometimes they are excruciatingly painful. I have been seeing Clare since January 2016 and have had a total of 4 treatments. During my first massage, Clare asked me to talk to my womb and tell it how I felt about it. I told my womb how much pain and stress and anxiety it caused me, I was actually taken aback, I hadn’t fully realised the extent by how much resentment I had towards it. My womb responded by saying that it wasn’t to blame. I then saw a very dishevelled, unkempt old lady living inside my womb, I felt that I needed to take the old lady ‘home’ to give her a bath and take care of her, I meditated on this vision at home and after doing this several times, the old lady emerged into a beautiful young lady, who was me. During one of my meditations, I was talking to the ’womb lady’ after a while she told me that she had to go because she had something to do and climbed back into my womb. The next morning my period started, it was totally painfree and blod-clot free too, I was thrilled. I had another period just 5 weeks later, which again was painless and clot free. It was also totally unexpected as my periods are usually very irregular. On my fourth treatment, I explained to Clare that my period was overdue, although I was experiencing pre-menstrual symptoms so I knew that it was on its way soon. I normally experience pre-menstrual symptoms for about 2 weeks leading up to my actual period. As soon as the treatment was over I returned home to find that my period had started! I went to see Clare back in the Spring after having been told by doctors that I was not producing oestrogen or ovulating. This was as a possible result of taking the contraceptive pill long-term. My husband and I were desperate for a baby and wanted to do all we could to make it happen. When I met Clare I had been depressed for a while and was finding it hard to think about anything else. I felt like I was letting my husband down by not being able to give him a child. Clare was encouraging and genuinely seemed to care. She helped me talk through how I was feeling and was able to reassure me that I could get on top of the situation. I came out of my fertility massage session feeling renewed and positive about the future. I felt like I was suddenly in control and incredibly after just a few short weeks I became pregnant. I’m now 13 weeks and an extremely happy and excited mummy to be! I truly believe that the fertility massage was able to help me remove the block I had and enabled my body to start functioning as it should. I can’t recommend Clare highly enough. For anyone who is facing fertility issues even just one session with Clare will leave you feeling hopeful and whole again. I’m typing this one handed whilst holding onto my five week old little girl. She’s so beautiful. I’ve called her Leyna which means ray of light. To me that means hope and that’s what I learnt when we worked together. I really believe that without that healing I wouldn’t have been ready and whole enough for her to be born. I thought of you so often during my pregnancy, especially when my womb did actually get that big!! Something which I never thought would happen before that work we did. I’ll never forget the day that me and my womb held hands again, when I finally felt whole and forgave myself! When I first went to Clare I had been trying to conceive for over a year and a half and being forty, felt I had no time to waste and a huge pressure regarding conception. She had explained to me about what the massage entailed though I found it to be much more than described. The first treatment with Clare was profoundly deep and powerful, so much more than I can write in words. I felt for the first time in my life I truly connected to my body as a woman and also to my womb. The follow up to the treatments were outstanding. Clare has a wealth of experience to draw upon and gave me so many brilliant tips and advice on things to help me, both mentally and physically on this journey. I also regularly did the self massage which was taught by Clare in a very easy to follow Dvd, also the castor-oils packs which she explained. I felt so supported and Clare was always ready to help, and respond to my questions and emails. Clare played a very crucial part in my ability to say I am now 7 weeks pregnant! I thank her from the bottom of my heart for all her help and amazing technique. I am so blessed to be treated by Clare: Wonderful energy. Magic touch. Most importantly – she really cares. I just love her holistic approach, it feels so right. On a mental level I learnt a lot about my own body, about stages of periods, signs of ovulation and more. On a spiritual level I came to appreciate my own Femininity and connect with my Womb through Clare’s insightful and intuitive guided meditations. On a physical level my periods improved a lot, they are more regular with clear bleeds and no pain. I have worked with Clare since the sad loss of my baby boy & subsequent miscarriages. Instantly upon meeting Clare I was struck by her warmth & empathy. There are some people in life who clearly are devoted to helping others, Clare is one of these good people. For the first time since the stillbirth of my Son & with the exception of my husband, I felt listened too, truly heard & understood. Clare’s empathy, professionalism & passion radiates from her. I genuinely look forward to my treatments which consist of a true fusion for the mind, body & soul. I have found my ovulation & periods less painful, my luteal phase has lengthened & my pmt, so much more manageable. The massage affords me some ‘me’ time whilst the guided visualisation has supported me in letting go of pain, fear & angst. I feel a happier, better person. Clare creates such a supportive, relaxing environment, free from judgement. It can be disconcerting to lay one’s self physical-(in part) & emotionally bare yet I have done this without hesitation. I trust Clare, implicitly. 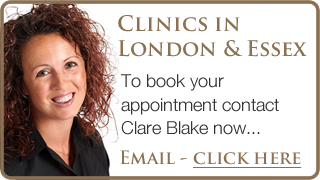 It is clear to me why Clare is such a highly recommended practitioner. She is so very skilled & knowledgeable. I have changed aspects of my diet to include more nutrition & I now take better supplements to support my physical & emotional well-being, all based on Clare’s sound advice. There are not enough superlatives to describe Clare’s exemplary work. I genuinely believe I will always have a connection with her & she will never fully comprehend how she has helped me in my darkest hour. Well I’m not going to start this testimonial by screaming I’m pregnant, because those letters used to annoy me. But I will start by saying that it I truly believe it was a mixture of things/steps that I did that has welcomed our child to us – and Clare Blake was one of them. Firstly after many negative results, an ivf round where I didn’t produce any follicles and 3.5years of trying, I was absolutely desperate to be a mum, it’s all that I could think about. But that’s the first thing I started to change – my mind. I decided that (although it was going to be incredibly hard) I was going to block out all the negativity and instead of DESPERATELY WANTING I started WELCOMING HIM/HER to us. When ever I had a private moment I started talking to our child, telling it how much I loved it and how my husband I were excited about them joining us. Secondly I just knew that this negatively had caused a block between my head and my body – well my especially to my ovaries – which at this point I had no love for. So when I had heard about Clare and her fertility massages I instantly knew I had to see her (in fact I took an afternoon off work, as I knew it was the right decision). As soon I meet Clare I made it very clear that although she wanted to know my past fertility history this wasn’t going to define me anymore, and that I wanted to tap back into my body and spiritually connect with our future child. The amazing thing about Clare is that she instantly understood me; she put the notes away and got to work using her intuition. Clare’s massage took me back inside. She helped me reconnect my mind and my body. It was a way of stepping out of my wanting head and creating a physical welcoming space. Clare never told me anything negative, she only goes with her gut instincts and what she felt. And I completely respected everything she said. As women we all love a bit of pampering and an occasional massage, but if you are struggling to conceive, like I was, I recommend seeing Clare to help massage the most important places in order to create a welcoming space for your future child. Good luck, and keep welcoming him/her. They need to know they are loved. I have visited Clare for a few massages treatments, she is very professional in everything that she does. She lets you know what will be covered during the session but what I really like about Clare is she sits with you before the session to find out what your individual needs are so she can ensure she covers this in the massage. I have a slight problem with my coccyx and she ensured that this was incorporated into the massage. The massage is very relaxing. It feels great to have a professional working with your womb to be in the best possible condition. On occasions Clare has to go deep with the massage which is what your body needs at that point. Both Clare and I are spiritual people and as she is aware of this she does a tailored visualisation whilst doing the massage. I really enjoy the spiritual connection. She only covers this element if you are wanting to. You come away feeling as if your body has been well looked after. I wholeheartedly recommend Clare to anyone who would like a relaxing whole body massage but to have your womb and reproductive area specifically massaged by a qualified practitioner.